Michael Boffa received his BSc, MSc, and PhD, all in biochemistry, from Queen’s University in Kingston. He did his PhD under the supervision of Dr. Michael Nesheim, where be began his work on thrombin-activatable fibrinolysis inhibitor (TAFI) that he continues to this day. He remained at Queen’s to do postdoctoral work with Dr. Nesheim and Dr. Marlys Koschinsky, and was then appointed Assistant Professor in the Department of Biochemistry at Queen’s. In 2008, he and Dr. Koschinsky moved to University of Windsor, and Dr. Boffa was promoted to Associate Professor and granted tenure the Department of Chemistry & Biochemistry in 2013. He joined the Department of Biochemistry at Western in 2016. 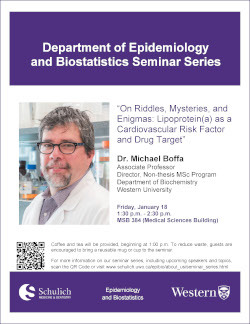 His work concerns structure/function relationships in TAFI and thrombomodulin, and in collaboration with Dr. Koschinsky he has a major interest in the biochemistry and clinical epidemiology of lipoprotein(a), which he will be speaking about today.